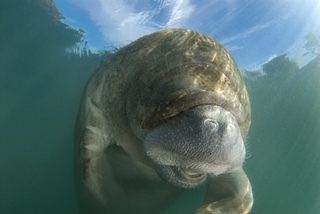 Look but Don’t Touch a Manatee … you could end up in jail! Saturday, February 6th, 2016 at 6:19pm. A couple of years ago a Florida man posted pictures on Facebook of himself and his daughters playing with a baby manatee. Sounds innocent enough but according to the Florida Manatee Sanctuary Act, “it is illegal to molest, harass, disturb or touch a manatee”. The Florida Fish and Wildlife Conservation Commission authorities arrested the Florida native. The man had no idea it was illegal to touch the “vulnerable species”. The man faced a misdemeanor charge that entails a couple hundred dollars fine and a couple months in jail. He meant no harm to the little manatee.